This Spring, Lafayette Elementary School students will able to register for tennis classes on Monday through Thursday at 3:30 through the FLEX Academy's Enrichment Program. Please register through the Lafayette School's HSA website at https://flexacademieslafayette.jumbula.com/#/welcome- . All other classes at Lafayette Park tennis courts on Monday through Thursday at 4:30 and 5:30 can be requested through this website. All classes on Friday at 3:30 and 4:30 can also be requested through this website. They are open to boys and girls in all schools in the area. Please check the class schedule for available slots. You can also contact Paul Rosenbaum with any questions about the classes at (202) 441-0925. These classes are not on the D.C. Department of Parks and Recreation's online registration system. 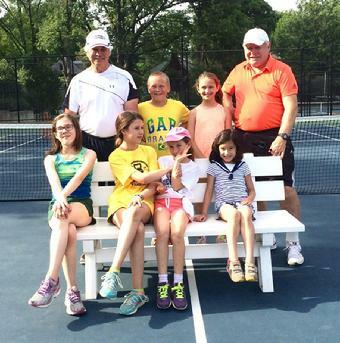 We thank them for letting the Lafayette Tennis Association use the courts for the outdoor community tennis programs. If you have additional questions, please click on the Queries tab for contact information. Class times and ages may change if not enough students sign up for a given time slot.